Polish-born Maciej Lyko’s interest in wine developed while working as a salesman at at Mielzynski, one of Poland’s foremost wine merchants. 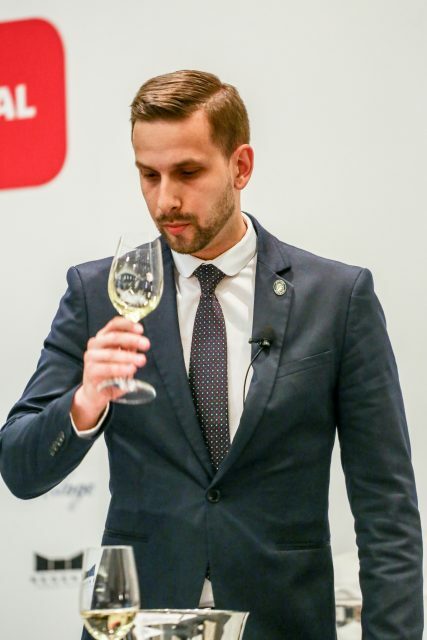 During this time, Maciej successfully passed the Wine and Spirits Education Trust advanced exam, which set him on the path to hospitality and sommellerie. Maciej moved to London in 2014, and landed a sommelier role at Gordon Ramsay’s Michelin-starred restaurant Maze. The following year, Maciej joined the team at Launceston Place in Kensington as assistant head sommelier, working under Piotr Petras. Following Petras’ departure, Maciej accepted the role of head sommelier at Launceston Place in 2018. Already holding the Advanced Court of Master Sommeliers certificate, Maciej is now preparing to take the Master Sommelier exam. Here, he shares his love of Chenin Blanc from the Loire, what it was like to serve former PM David Cameron, and reveals his perfect pairing to langoustine ‘ice cream’. When I was 22, I started working as a wine salesman for Mielzynski, one of Poland’s biggest wine merchants. The experience was great and gave me the chance to work with people who had the same passion for wine and who could share their knowledge with me. I then wanted to bring my experience to a restaurant environment, which led me to move to London where I worked at Gordon Ramsay’s Maze. There are so many parts of my job that I love: meeting new people; working with passionate colleagues and exploring new food and wines. Every day brings something new which makes this job so interesting. There are probably many misconceptions, and I’m sure some people think we only travel and drink wine! In reality it’s slightly different. A glass of Riesling, or a Chenin Blanc from the Loire Valley. I love the acidity and minerality of those two varieties of grape. At the beginning of my career as a sommelier, I accidentally used a bottle of Picpoul to top up the glasses of a table drinking some very expensive Burgundy. As you can imagine, it was not the best day of my life. Listen and learn from people who have more experience than you. It was a bottle of Georg Breuer Schlossberg Riesling. I tasted it and realised that it is my favourite grape variety: complex, aromatic and very elegant. I will never forget a trip to Madeira, where I tasted some of the best wines produced on the beautiful island. I am not annoyed by guests’ habits. The only thing that I really don’t like is impoliteness. My colleagues! I am very grateful to work with such passionate people who give me inspiration to develop and be better every day. Jamon Iberico and a glass of Sherry. It’s not very original, but I love it. It’s too difficult to choose just one. It would either be Rheingau or Madeira. I have absolutely no idea. Maybe I would be professional coffee drinker, music listener and book reader! I am not a big fan of Gewürztraminer. David Cameron is the most memorable customer I have served. He was very humble and polite. London is one of the best cities when it comes to hospitality. It is a great place to develop as a sommelier, meet people from all over the world and taste some of the greatest wines. The list is very long, but I would like to visit Australia as I have never been there before. delicate, mineral character which compliments the langoustine perfectly, but also has enough freshness and acidity to cut through the crème fraîche. It’s a lovely combination.